Sorry for the shocking the headline but honestly I can’t think about anything better than this headline. On the first day of Eid Al-Adha, the hashtag “#I_support_Menna_Gobran” led the top Twitter trends with over one thousand tweets in no time in Egypt. Many Egyptian tweeps expressed their support to a young lady called Menna Gobran as well their anger and disgust for what happened to her in those two weeks because of sexual harassment. The story of Menna Gobran started on 15 August when she uploaded a video that she recorded earlier while waiting for her work’s bus in a busy street in New Cairo. That video titled “Does this happen in the Fifth Settlement too ? ?” showed a part of a conversation with a man who was reportedly sexually harassing her from his car. The video showed him coming off his Dodge pick up track “it is expensive in Egypt” asking Gobran if she wanted to drink coffee at “On the Run”Convenience store in Exxon Mobile fuel station where she was standing. Filming him, she said no and he said “I am so sorry” in a very bad tacky artificial accent and as he went back to his car, she filmed its license plate. Recently Egyptian girls film or photograph the license plates of sexual harassers in the streets to mark them and also to expose them socially on social media to fight back the sexual harassment epidemic in the country. Another video filmed by Menna Gobran resurfaced dated a year earlier from the same place showing another man but older who sexually harassing her explicitly telling her that he lived nearby at “Mohamed El-Habob” street or “Mohamed, the lovable or adorable”. The two videos were so provoking to me but what has been really causing controversy was the debate among social media users about the first video. Many people especially men see that there was nothing wrong in what that man had done. He asked the girl “who is a total stranger” for a coffee politely and she said no. They believe that that man was the victim of a girl that seeking fame. It did not stop there. I do not know how those people mostly from men believe that people in the West are acting like that. Other comments wondered about how she deserved to be harassed because of the way how she deserved to be harassed judging from her Facebook profile’s photos. “Photos of her wearing a little strapless revealing black dress as well another of her doing a split in a gym went viral as proof on that sick theory”. The whole affair was just getting started as we were introduced to the infamous hero of the incident, the man’s name is Mahmoud Soliman and his friends say that he is a good guy and not a harasser. He became known online and offline as "The On The Run" guy. He removed the video later. To defend herself, Menna Gobran recorded a video saying what happened on that day and how she was waiting for her ride to work at the meeting point in front On The Run store when that man appeared in his car and harassed her rudely. At the same time, friends of the second harasser aka Mohamed El-Habob reported the video he appeared to Facebook administration and it was removed !! That video did not stop or even made people rethink their position and support that girl who turned out to be working in two jobs to support herself. We found 30-years-old Mahmoud Soliman speaking in TV and Radio shows defending himself then he traveled to Gouna and became a celebrity where people “Supposedly crème del crème of the Egyptian society” were rushing to take a photograph with him !! He even appeared with alleged influencer/self-claimed feminist and cinemaphotographer Salma El-Kashaf in a video repeating his invitation to drink coffee but she said that she drank espresso laughing hysterically for no reason. Due to online criticism, El-Kashaf closed down her social media accounts after apologizing. Sadly, Salma El-Kashaf herself was in hot waters last month when leaked photos she took from two years in a trip for her friend aspiring actor Rahma Hassan while semi-naked in a bikini surfaced online without their consent. The same people who are standing with Menna Gobran stood with El-Kashaf and Hassan because it is the right thing to do. The video of Soliman with Salma El-Kashaf was just the tip of an iceberg in Gouna. 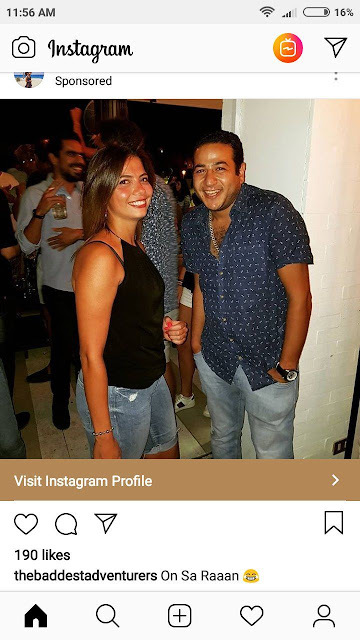 It reached the level that a travel blogger shared and sponsored her photo on Instagram with him in Gouna at some nightclub before she removed it. 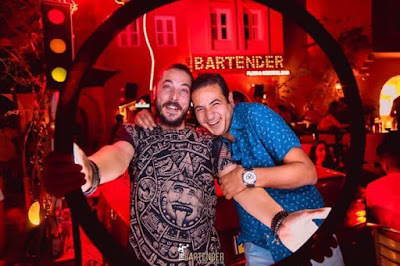 His photos with the people at Bartender El-Gouna also went viral but soon enough the owner of the famous nightclub and bar had to remove them. The Snack Shack El Gouna restaurant was too happy that this guy is its customer too !! Mahmoud Soliman even posted a photograph with famous actor Nelly Karim who is spending the Eid vacation there. It made many people angry including me as Karim was the leading actor in award-winning 678 film, the first Egyptian film to deal with sexual harassment. For own her own defense, Nelly Karim told her friends that she did not know who that guy was and he was the one to ask her for a photo. 6IX degrees Night Club in North Coast made a special remix for his silly pick up line. I can’t find the video anymore. To make things worse, the Comics and Sarcasm Facebook pages wagon jumped into making fun of the whole situation and the man as well the girl normalizing the whole thing. Now I am reading that Soliman was offered to appear in some famous coffee ad and some film producer talked to him to appear in some film !! On the other hand, Menna Gobran lost one of her two jobs after the incident. Some saying that she lost her jobs as a sales rep in some company because of the incident while others “including colleagues” say that she was not offered a contract because she did not achieve the required sales quota. Boldly, Mahmoud Soliman’s brother is also speaking to the media now saying that his family can help her to get her job back if she apologized to Mahmoud and his family for the exposure she caused !!!! They get a nerve for real. It turned out that Mahmoud Soliman is a son of a former top NDP official in Suez governorate who got too many question marks about his wealth. Unfortunately, “The On Run” guy got more exposure than that white-haired old man who changed his looks according to friends but still allegedly harassing girls and women at the same spot in New Cairo. Menna's incident opened back the sexual harassment discussion in Egypt and this time I find myself in front of hateful and disgusting misogynist in an online discussion that scares me. I am not speaking about the usual justification blaming the victim for what she is wearing but rather real violent misogynist. What is even scarier, this misogynism is notable among men from younger generations who are still in high schools and universities. In 2013, a UN study stated that 99.3% of women in Egypt experienced sexual harassment in a way or other. The newly imposed sexual harassment law with tougher penalties helped somehow to reduce that intensity epidemic but it is still a bigger social problem that should be tackled carefully in our culture. The incident of Menna Gobran shows how the society can turn the whole matter into a joke because the sexual harasser is a rich guy with a league of fancy cars. Menna is no longer the victim but rather the victimizer, the whore and the fame seeker while the On The Run guy is a society celebrity now and influencer !!! I am very angry and sad because any girl including myself can be in Gobran’s place and find also the society against her. Many girls can be in Menna's position and even worse and will not report it to the authorities for fear of social backlash especially if we are speaking about wealthy sexual perverts. This incident makes me believe that it is too early to speak about women empowerment in this country. Great post as always, but what was also frustrating is that women online would comment that the girl does this for attention. Misogyny is so imprinted in our society, something has to change. So the president of Egypt commented on the Kiki dance in his last live televised discussion. Would he refer to this incident (along with the stabbing in Alexandria beach)? No, I do not think this pea-sized brain dictator would care about that. To hell with him and his army.